PeopleFlo’s product and process innovation capabilities are focused entirely on helping industrial manufacturing companies – mainly companies the machinery and equipment segment – accelerate organic growth. 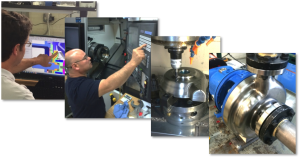 This industrial manufacturing focus has enabled PeopleFlo to develop distinct innovation capabilities tailored to engineered products that are sold in complex business-to-business markets. Our lean systems capabilities underpin all product and process innovation activity from idea generation to building a continuous-flow production cells. The principles of understanding customer value, organizing value streams, creating flow, establishing pull and continuing to improve, provide a strong foundation for product and process innovation in the manufacturing environment. Our deep manufacturing innovation knowledge and experience enables PeopleFlo is to become a seamless extension of our clients business and strategic innovation partner. Integrated Product and Process Innovation. When it comes to creating value in a manufacturing environment, PeopleFlo has a strong belief – how you make a product contributes just as much as how you design a product. 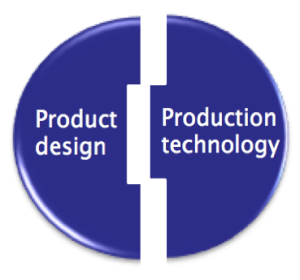 Our holistic approach integrates two value drivers – product design and production technology – as if they were one. This insures that individual product development elements are not maximized in isolation, but optimized to fit overall product line objectives. Most importantly, this approach unlocks big opportunities to create more value and ways to reduce risk by making visible problems and opportunities that hide at important integration points. 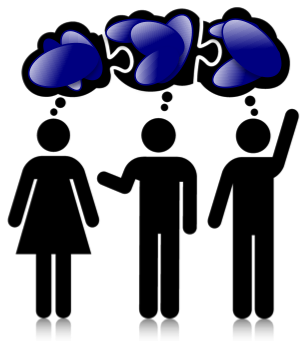 Idea Generation Process. PeopleFlo’s idea generation process is a structured yet flexible way to generate lots of ideas, converge these ideas to the best alternatives and model the top ideas to bring them to life. We apply this process across a wide range of development activities and throughout all stages of product and process development. Idea Development Process. Our idea development process reactivates ideas as we advance product design, make prototypes and test prototypes. PeopleFlo’s dynamic prototyping process takes many forms over the course of development – from cheap and fast foam mock-ups early in development to fully functional high-alloy steel prototypes later in development – that brings vitality to the idea development process. Making and testing prototypes drives learning and inspires creativity in ways that spark valuable new unforeseen ideas. Iteration Process. 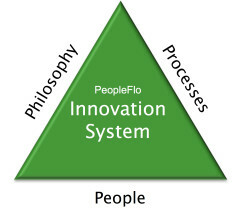 PeopleFlo has the capability to develop products and processes based on an “iteration” structure that solves one of the biggest innovation problems for manufacturing companies – the linear and rigid structure of the traditional stage gate process smothers creativity and causes most programs to fall short of expectations. The traditional stage gate process allocates time for generating ideas and developing concepts but the time for creativity comes early in the process and it comes around only once. Few project teams have the ability to generate high-impact ideas, that are spot-on, so early in the game before the creativity window shuts and the driving force shifts to getting to the next stage. PeopleFlo’s iteration process combines the best elements of a stage gate process – high-level structure and management reviews – with an iteration structure that enables a project to become a series of quick complete mini-projects each of which is dependent upon the in-depth learning, discovery and results of the previous iteration. The lessons learned from one iteration are used as a starting point for the next iteration to drive important changes and improvements. PeopleFlo’s iteration structure has distinct elements tailored to the industrial manufacturing environment. 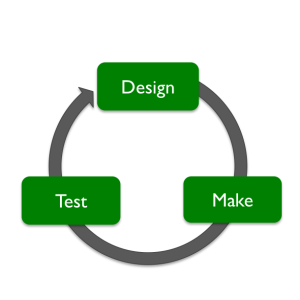 Our standard iteration structure for a project consists of three to four primary iterations. 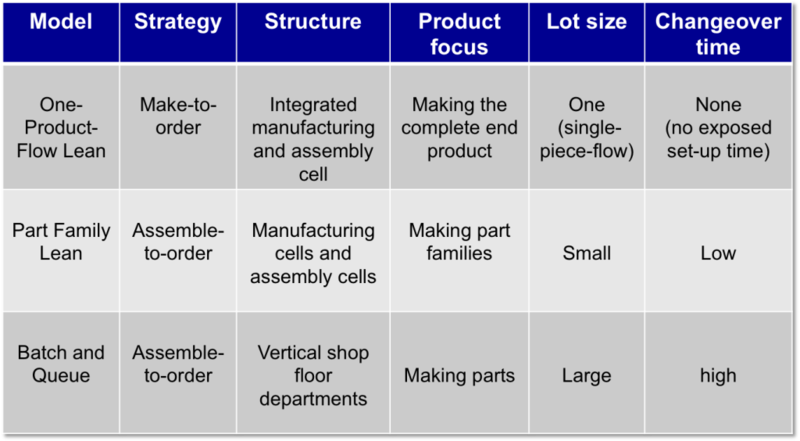 Because of the complexities inherent with engineered industrial products and because of the high expectations of business-to-business customers, each primary iteration contains many idea generation cycles that target a diverse set of opportunities to create value. 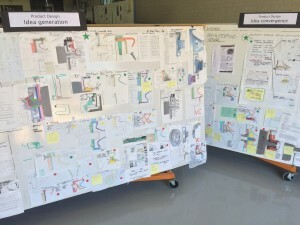 To complete the iteration, a diverse set of top ideas is fed into the idea development process and the product or process is designed, built and tested. Because we believe how you make a product contributes just as much as how you design a product, every primary iteration includes modeling and or building the complete production process. One-Product-Flow Processes. PeopleFlo’s process innovation capabilities are based on applying our creativity processes to production as well as our ability to design, build and test complete continuous-flow production cells based on an innovative process we call One-Product-Flow. 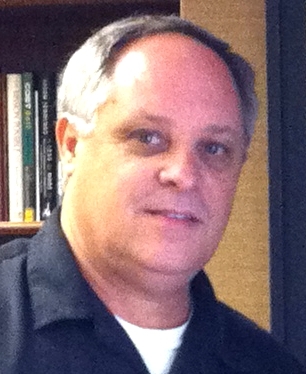 One-Product-Flow is a make-to-order production system built solidly on “lean” philosophy and tools. 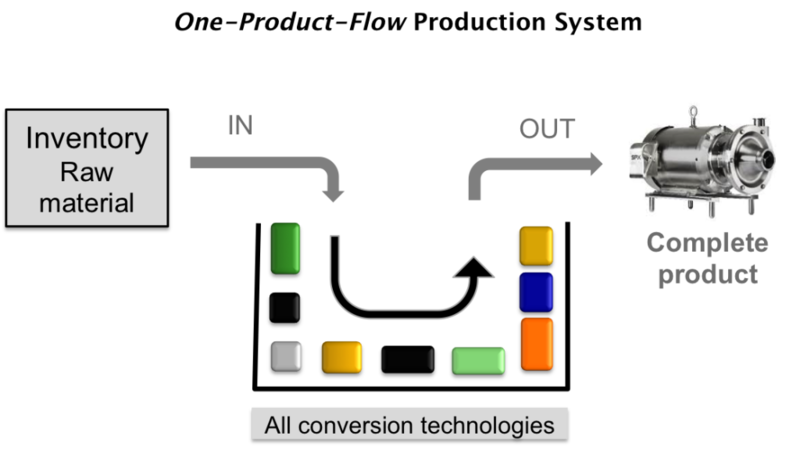 An innovative changeover system enables creating a continuous flow mini-factory for a complete product line of engineered products. 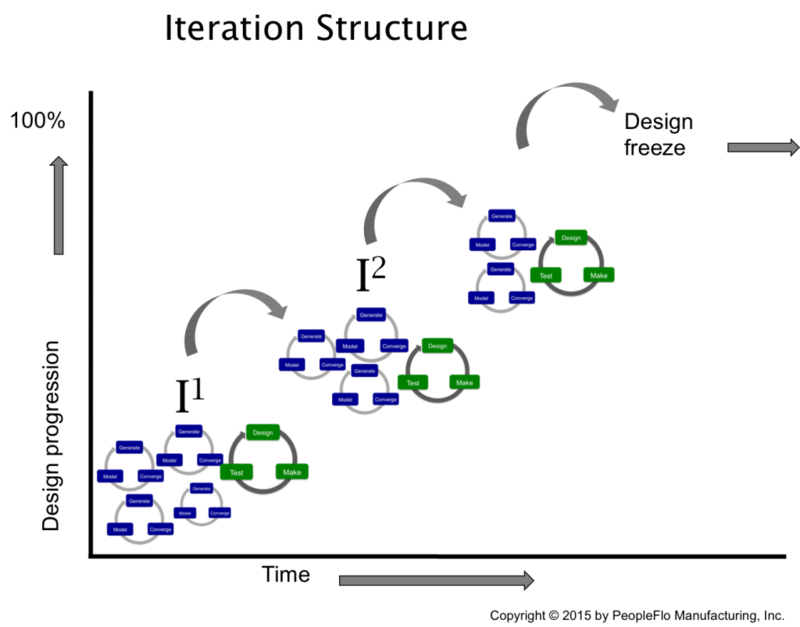 Where batch and queue production systems are typically organized around parts, and lean systems are typically organized around part families. One-Product-Flow is designed around a product line and organized to make a complete product – one at a time. 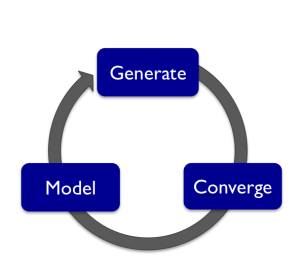 This information is based on based on actual results producing a product lines in One-Product-Flow. Please contact PeopleFlo for more information. "PeopleFlo has an end-to-end solution to innovation. I don’t know of any other company doing that. Their solution is game-changing." 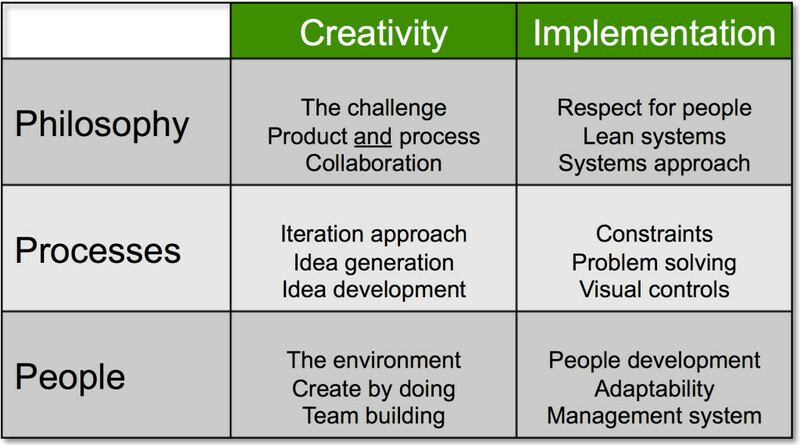 Processes, techniques and tools designed to help generate ideas and convert them into high-impact innovations. 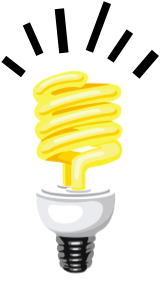 PeopleFlo's efficiency system is designed to eliminate non-value-added waste from product development and production. 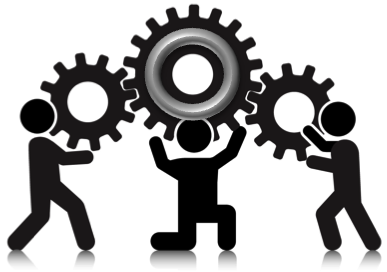 Collaboration based on high-performance teams, open innovation and alignment.